Real time status and performance information. 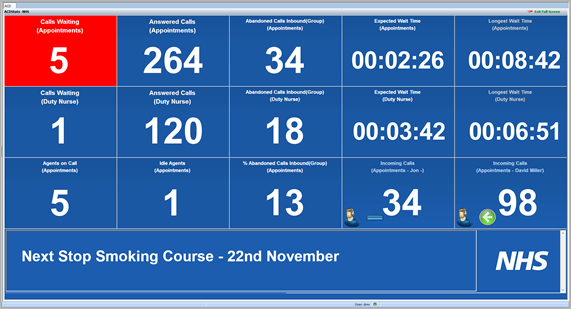 Wallboards make busy times easier by providing timely and useful information about your call flow and agent status allowing supervisors to act upon live statistics making fast accurate and informed decisions. You can have unlimited Office Pro wallboards deployed throughout your organisation providing up to the second status information driving and maintaining efficiency and boosting team morale. Information can be fully customised to display single and multi-site information, which can be displayed on; any networked PC monitor / LCD / Plasma display. There is no additional licensing required to display wallboards across any of your offices. 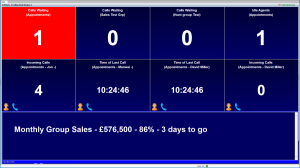 A wallboard is available from any Office Pro client application, installed on any networked PC. So this can be a supervisor, team leader or managers PC or a PC running a large flat panel LED/LCD or Plasma display. Tip: By increasing the RAM on a users PC and installing a dual graphics card, a client could be installed onto that PC allowing the staff member to continue working on their first screen whilst the wallboard is displayed on the LCD panel plugged into the other graphics port on their PC. Select from a range of ready made customisable templates. 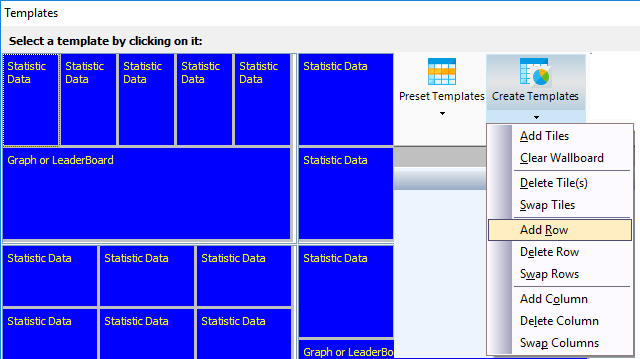 Right clicking on any tile displays the Panel Configuration window allowing the; content, fonts, colours and properties of the tile to be set to meet your requirements. 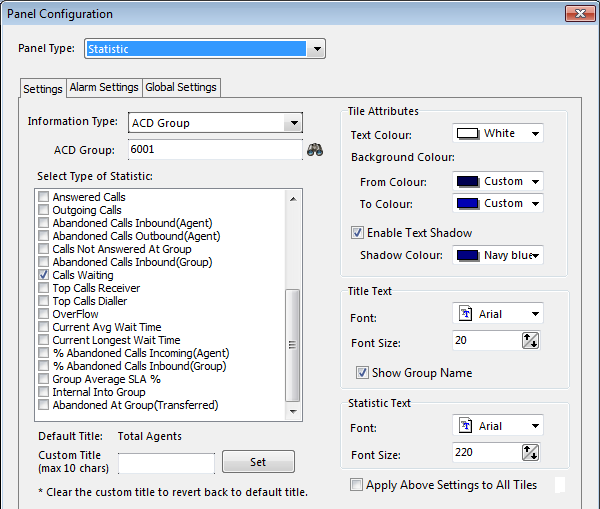 It’s also possible to set alarms to change the colour of the tiles to highlight thresholds and alarm conditions i.e. Calls in queue greater than ‘X’ qty./secs. Each tile can be set to display a specific statistic for a group or an agent. 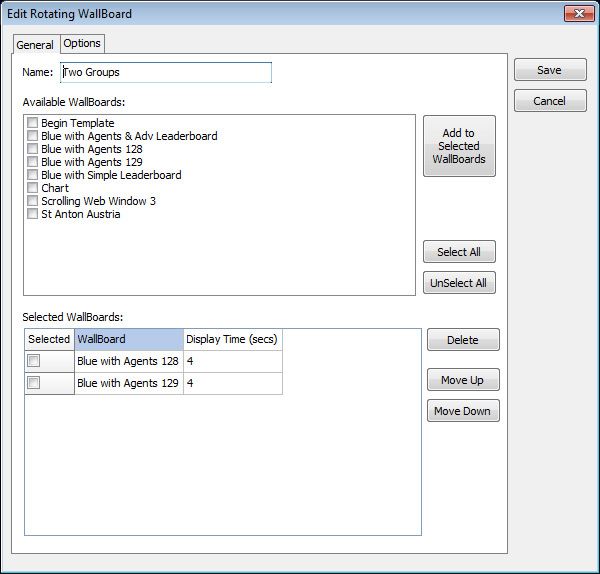 In addition to displaying statistics in tiles for agents or ACD groups, it is also possible to add the following to the wallboard: chart, leaderboard, clock, static image, web browser, text or aggregate statistics for multiple groups. A leaderboard is a simple way of viewing multiple statistics for individual extension users/agents. Columns to display can be selected and status colours set. 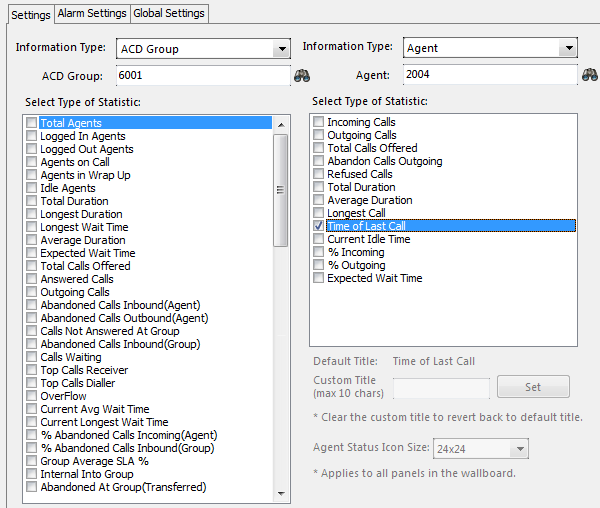 In addition to standard call statistics, it is also possible to display call outcome code counts for each agent. 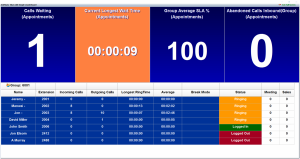 Chart content can also be selected and displayed on the wallboard. An area of the wallboard could also be set as a web browser in order to display a website, IP camera output or any other addressable content. 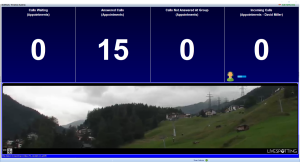 The image below shows a live feed from an IP camera in St Anton, Austria. You may of course set it to view your front door, reception, warehouse, other office, loading dock, etc. A Wallboard panel can be set to display a webpage, or other content accessible via a web browser such as an IP camera output or even a vertically scrolling message page as shown below. There are many freely available scripts on the web however the one we’ve listed below is easy to use, quick to deploy and easily editable in order to provide up to date messaging for agents. 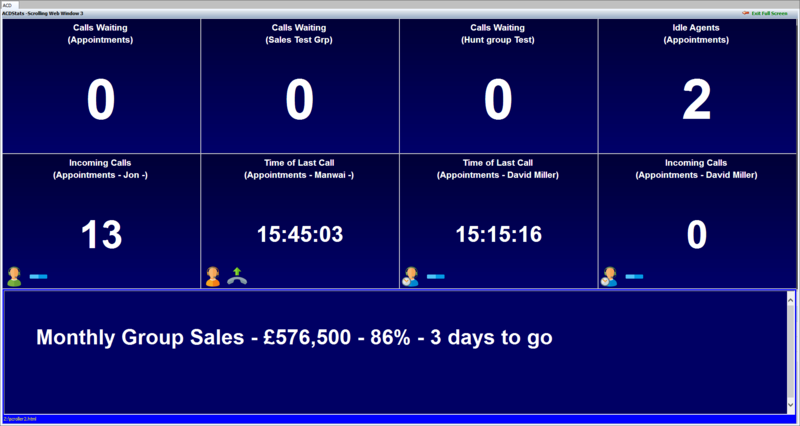 On occasions it is desirable to display more information that can be sensibly displayed on one wallboard display. On these occasions we would recommend using the rotating wallboard option to allow multiple wallboards to be cycled through every few seconds. To enable this, simply give the new rotating wallboard a name, select the boards you would like to include and the time to display each. There is also an option to change the timer settings for the fade transition between boards (0 Fastest – 255 Slowest). Once saved, the rotating wallboard will be available in the same place as the standard wallboards with start and stop controls available on the top menu bar.